Is Egypt the new gateway to Europe? Why have fewer Syrians and more Africans and Egyptians embarked into the sea from the north coast of Egypt? Nearly 80,000 people arrived in Italy through the Central Mediterranean route (Egypt and Libya) in the first half of this year, meaning that 2016 will likely surpass the 150,000 that arrived last year. 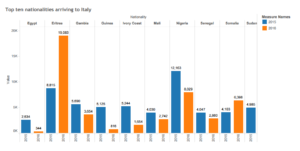 With UNHCR data indicating a marked increase in the number of Egyptians who traveled to Italy from the Central Mediterranean from 344 in 2015 to 2,634 so far in 2016, Egyptians are now one of the top 10 nationalities crossing that portion of the sea. Egyptians appear to be travelling in greater numbers because of worsening political and economic conditions in their country – but that is coupled with a growing awareness of Mediterranean migration routes and the apparent promises of life in Europe. The majority of Egyptians arriving in Italy are unaccompanied minors, according to the International Organization for Migration, a phenomenon that can be attributed to a 2007 readmission agreement between Italy and Egypt which facilitates the expedited return of Egyptian nationals who are over 18 years old. Ahmed, a 17-year-old Egyptian from Kafr al-Sheikh, told Mada Masr that he’s tried to leave Egypt since last year, “but always had the door closed in my face.” When his cousin made the crossing with a smuggler in May, Ahmed decided to follow him. But Ahmed never reached Italy. He was detained while his group made their way through the northern countryside. He was released shortly afterward and plans to keep trying to cross until he succeeds. After the spring-summer increase, June has seen another surge in departures and arrivals from Egypt, with the EU border agency Frontex warning that the number of people arriving in Italy outside state-sanctioned procedures rose by 24 percent compared to the previous month. 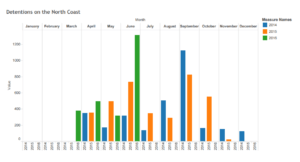 The surge is also visible in immigration detention data from Egypt’s north coast. Just over 320 people were detained in May, but, in June, that number rose to 1,136, according to the UNHCR. At the same time, some suggest this may be part of seasonal fluctuations. Flavio Di Giacomo, the spokesperson for the International Organization for Migration (IOM) in Rome, explains another reason behind the rising flow of migration from Egypt. Beyond providing a line of flight for Egyptians, the routes that previously passed through Alexandria have become increasingly internationalized since Syrians and Palestinians were the predominant demographics passing through Egypt’s second city in 2013 and 2014. At that time, many of the smuggling kingpins were from Syria or Gaza – if not Egypt. Names like Abu Hamada, Abu Bahari: faceless fathers of invented offspring and the sea. However, this year, less than 200 arrivals of the 80,000 who have arrived in Italy from the Central Mediterranean were Syrian – a staggering reduction compared with last year’s flow, when 4,273 Syrians left North Africa, according to data from the Italian Ministry of Interior. Why? Syrians in Egypt have fewer migration options than ever before, deteriorating economic conditions and possibly less will to travel. A socio-economic assessment of registered refugees conducted by UNHCR has revealed unexpected levels of poverty among Syrian refugees. Up to 60 percent of Syrian refugees surveyed were living on between zero and LE296.20 per capita per month. Another 28 percent lived on between LE296.20 and LE592.40. Crossings from Egypt tend to take a week or longer. While at sea, smugglers often transfer hundreds of people from boat to boat, often resulting in capsizing, callous lack of care for life and nameless bodies in news stories. Combined with the notoriously perilous route between Libya and Italy, it’s estimated that the chances of dying at sea in the Central Mediterranean are as high as one in 23. Last year, many Syrians in Egypt would fly to Turkey and depart in boats from there. But that route has since been closed, thanks to Turkey’s new restrictions on Syrian arrivals to airports, as well as the EU-Turkey deal signed in March. Struck at the behest of the European Union, the deal effectively attempts to shut down the Balkan route and allow for the return of irregular migrants – including Syrians – back to Turkey. Many refugees, likely with family or friends who made the safer, shorter journey from Turkey last year, may be less inclined to take boats from Egypt as a result. And with xenophobia on the rise and asylum systems under unprecedented strain, viewed from the other side of the Mediterranean Sea, a future in Europe has never looked more uncertain. Also, on the detention of immigrants and refugees in Egypt front, the number of Syrians is down – constituting just one percent (17 individuals) of immigration detainees through June – down from 45 percent in 2014 and 15 percent in 2015. But even as Syrian migration from Egypt is declining, people are still on the move. Mada Masr has interviewed six Syrian families who travelled from Sudan to Egypt this year, part of a slight uptick in Syrian crossings that has been observed and confirmed by aid workers on both sides of the border. The route is viable largely because Syrians can still enter Sudan without a pre-arrival visa. However, they need smugglers to help them cross into Egypt – exactly what Jameel Jamal, originally from a town in Quneitra near Syria’s border with Lebanon, did with his wife and baby boy earlier this year. The family flew directly from Damascus to Khartoum, and, once there, they waited for a smuggler. “Two days after we arrived, I got to know Hassan, a middle-aged Sudanese man, who offered to take us to Aswan, in a small pick-up truck,” recalls Jamal, who asked for his real name to be withheld. The family then flew to Port Sudan on the northeast coast, where Hassan would smuggle them into Egypt at a cost of US$1,000 each. Jamal’s baby went for free. They moved at night, split into two vehicles. Packed tight, hurtling over bumpy and dangerous roads and even pursued by Sudanese security forces at one point, Jamal remembers a difficult journey. Detentions always accompany new movement. Jamal, his wife and son were part of a group of more than 80 Syrian refugees, including dozens of children, detained in several police stations in Upper Egyptian and Red Sea governorates after crossing from Sudan earlier this year. They were held in detention for more than a month, but not before the Syrian opposition delegation to Cairo urged for their release. Jamal had personal reasons for staying. Other Syrians interviewed by Mada Masr after traveling from Sudan have decided to remain in Egypt – at least for now. Only one family said they were considering taking a boat to Europe. The UNHCR maintains that most Syrians who’ve made the journey from Sudan have tended to register as refugees in Egypt, rather than then continuing on to Europe. 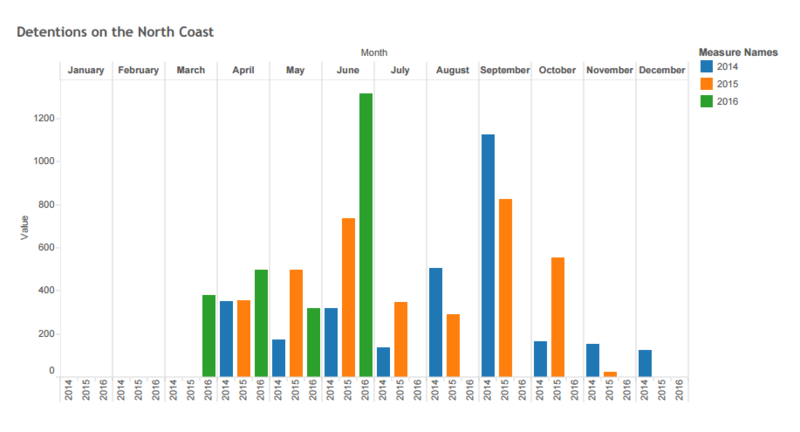 The increase in departures from Egypt’s north coast is being driven by Eritrean, Somali and Sudanese refugees and migrants: a reflection of more longstanding displacement and migration trends out of the Horn of Africa, as well as a shift away from the brutal danger of Libyan routes. Sudanese, Somalis and Eritreans are far and away the nationalities that have been most frequently detained on the north coast this year. 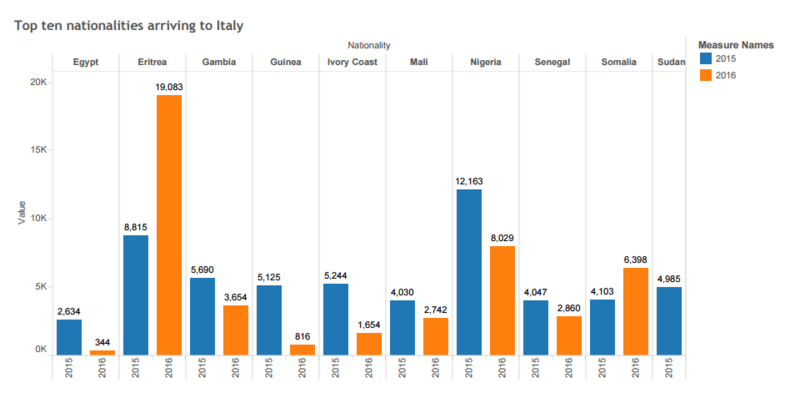 They are also among the top 10 nationalities arriving to Italy, showing that in the present, migration from Egypt is more closely tied to historic routes trailing out of the Horn of Africa. A large number of Eritrean refugees are now said to be waiting in and around Cairo’s Mohandiseen – already home to an existing Eritrean refugee population – readying to take boats to Europe this year. Many of them are new arrivals, using Egypt as a transit point. Eritrean activist Meron Estefanos says Eritrean refugees increasingly are turning to Egypt’s northern beaches to avoid Libya, after dozens of Eritrean refugees were kidnapped there by Islamic State militants last year. This, she says, is in addition toprolonged detention and brutal trafficking practices having long ago become commonplace. Estefanos hosts a call-in radio show in Sweden that considers its audience the Eritrean diaspora. 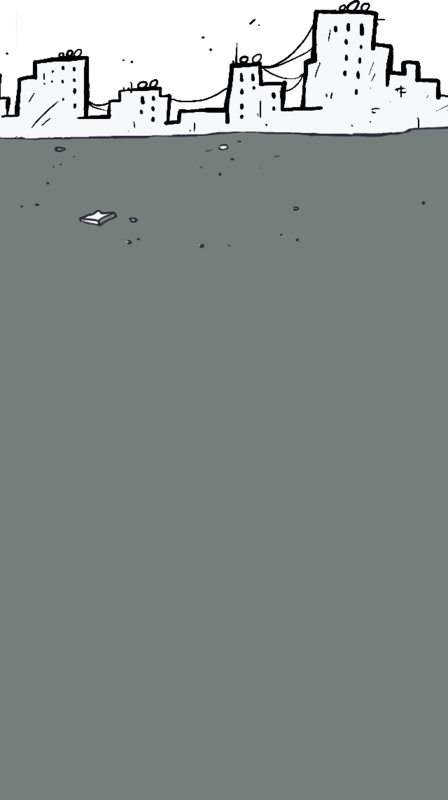 She can identify and track trends from the desperate phone-calls she receives from every corner of the migration trail: smuggler hideout, prison, sinking boat. And yet, since Egypt’s Sinai trafficking trade died out after 2013, after hundreds of Eritrean refugees had been kidnapped, trafficked into Sinai and tortured or even murdered for substantial ransom, the risks of Egypt’s north coast have tended to be lower. Still, Estefanos adds, an increasing number of people are being detained by Egyptian authorities or left to callous smugglers operating everywhere between the Eritrea-Sudan border to the southern Italian coastline. This summer, Somali refugee Hilal has traveled from his hometown in Somaliland – a place “where the fighting does not distinguish between children and the elderly” – to Cairo. Mada Masr met him in an apartment in Nasr City just a few days after his arrival in June. “To reach Egypt, we had to cross the deserts in Ethiopia and Sudan. On May 30, we packed our luggage and set off across the desert and the unknown,” he says, recounting how they departed from Somaliland’s capital, Hargeisa, and met a smuggler who’d take them across the Ethiopian border for $900 each. From Khartoum to Aswan, it was $1,000 a head, and, then, the price of a handful of bus tickets from Aswan to Cairo. EU officials have been warning about the formation of a new route through Egypt since the beginning of the year. Subsequently, the country has become a quiet priority in policy documents, not least the Partnership Framework, the EU’s latest attempt to outsource migration management policy to third countries around the Mediterranean Sea and beyond. The framework essentially attempts to make migration management a key priority in how the EU deals with third world countries, leveraging states to secure EU interests on migration management. The Partnership Framework’s communication states that the EU “will engage more strongly with Egypt, including through more financial assistance for capacity-building, the protection of vulnerable groups and socio-economic support to migration-prone groups.” An EU spokesperson tells Mada Masr that discussions on particular projects are still ongoing. EU plans with Egypt already include a training center for handling migration alongside Horn of African states, under the auspices of the multilateral Khartoum Process, a far-reaching EU initiative alongside third countries to “address the root causes of irregular migration” by offering aid money and development projects in return for border control and migration management. The training center is meant to be based at the Police Academy in Cairo, according to an April 2015 action plan that Mada Masr gained access to. Egypt may not be some new gateway to Europe, but migration to and from Egypt has become more dynamic, more in flux. How European migration management plans will try to put a stop to that remains a question, alongside what role Egypt will play beyond thwarting departure attempts and arresting migrants and smugglers.